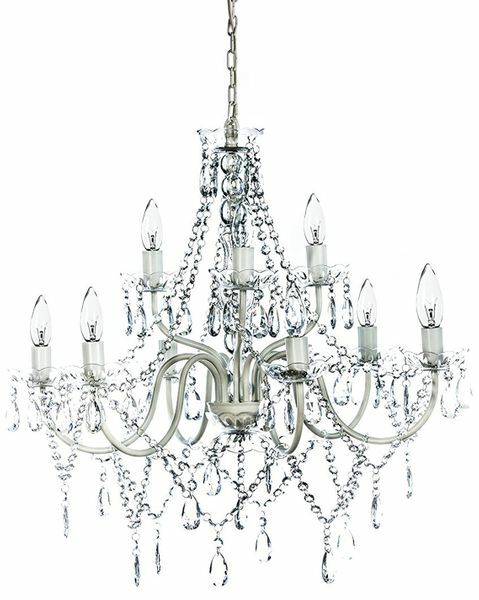 Home > Lighting > Chandeliers - Multiple Arm Crystal > Chandelier Gypsy Clear - 27" x 27" - 9 Lights - Collapsible! Our Large White & Clear Gypsy Chandeliers collapse for easy storage and transport, making them a favorite for event decorators! This 9 arm chandelier is 27" tall by 27" wide and the hardwire cord is white. The white hanging chain is adjustable up to 24" which gives lots of options for hanging it where you need it and with all the yummy faceted beads and pendants, you'll want to hang this beauty everywhere! This UL certified light uses 9x40 watt E12 chandelier bulbs (not included). 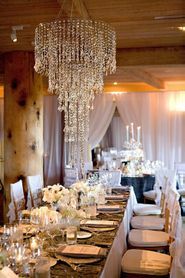 The arms are white and the rest of the chandelier is crystal clear. All of the clear acrylic beads and pendants are attached with small jump rings so it's very easy to add or subtract bling. A beautiful and easy way to glam up a bedroom or bathroom, dining room or hallway and don't forget your office! Just the right accent piece to add a bit a sophisticated elegance! 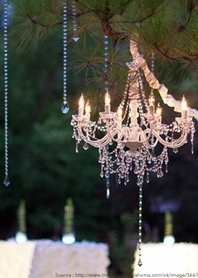 Since this chandelier only weighs 9 lbs., it's a great lighting option for weddings, parties and events and the moveable arms make this a dream event piece to transport and store! This chandelier is a direct connect fixture that should be installed by a qualified electrician.